The Shape EVF Mount Shoe Mount L Bracket is an EVF support for Alphatron, Cineroid, Zacuto, and Sony electronic viewfinders. It mounts to the Shape ASHS or ASHS1/4, and that allows you to adjust the bracket side to side and lock it in place. It features two spring loaded tension knobs that allow you to adjust the position of the viewfinder at two points, with each point featuring 360° of rotation so you can easily adjust the viewfinder to be visible from almost any shooting angle. The spring-loaded tension allows you to position your EVF where you want it and have it stay there without having to lock down the knobs. Of course if you need to lock the bracket in a specific position, just tighten the knobs all the way. The knobs are made from anodized aluminum and textured for a sure grip. The bracket is also machined from aluminum and anodized for wear and corrosion resistance. 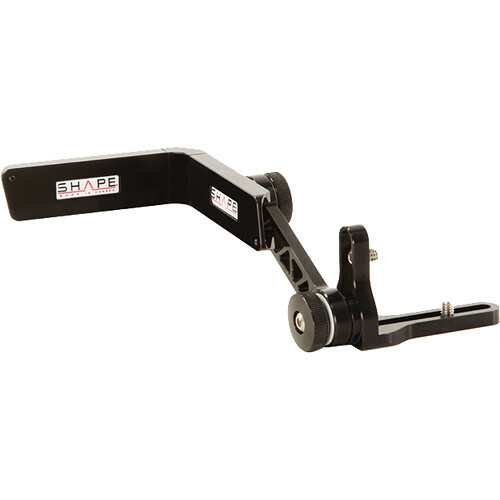 The bracket includes two stainless steel 1/4"-20 mounting screws that mount the EVF to the bracket. Box Dimensions (LxWxH) 8.7 x 5.4 x 2.4"
Does this product mount onto a hot shoe, or an existing shape mount?